Ray Zammit (Global Payments), Sergio Bellizzi (HSBC), Mark Ciantar (Continental Purchasing), Marvin Gauci, Emily Agius, Jean Paul Gauci, Zack Sammut, Sergi Huerga Marin and Clint Camilleri. The Definitive(ly) Good Guide to Restaurants Awards ceremony, held at the Radisson Blu Resort & Spa, Golden Sands, celebrated the outstanding achievement of Malta and Gozo’s top-rated restaurants – as voted by diners who took part in the Malta & Gozo Restaurant Survey online at www.restaurantsmalta.com. Based on popular vote, only 150 restaurants make it to be included in the latest 2019 edition of The Definitive(ly) Good Guide to Restaurants in Malta & Gozo. Dinner in the Sky Malta was rated Best Overall Restaurant for 2019. In the short time since its inception, this gastronomy experience has clearly captured the imagination of adventurous diners rating high on all counts – food, ambience and service. The results were revealed by Lisa Grech, managing director of the Definitive(ly) Good Guide Co., and presented by Clint Camilleri, Parliamentary Secretary for Agriculture, Fisheries and Animal Rights, Sergio Bellizzi from HSBC, Ray Zammit from Global Payments and Mark Ciantar of Continental Purchasing, on behalf of Villeroy & Boch, who supplied the commemorative award plates for the occasion. The event was sponsored by HSBC and Global Payments. This year’s survey, which was conducted in September, returned a high number of responses, with 3,153 participants who dined out once to twice a week – equivalent to 245, 934 dining experiences in a year. This year sees 26 new restaurants in the The Definitive(ly) Good Guide to Restaurants in Malta & Gozo and its portal, which was also launched during the evening. Award-winning restaurants were chosen, taking into account not only the overall rating but also individual food, service and ambience ratings, the number of people rating, value for money, comments and other data from the survey. Restaurants that won award plates included: Dinner in the Sky Malta; The Chef’s Table; Caviar & Bull Restaurant; Buddhamann; Tarragon; The Lord Nelson; Root 81; La Buona Trattoria del Nonno; Patakka Restaurant; Ta’ Marija Restaurant; Grotto Tavern; Venus Restaurant; Suruchi Indian Restaurant; Noni Restaurant; De Mondion Restaurant; Beppe’s Restaurant; Palazzo Preca Restaurant; Trattoria AD 1530; Porticello; SALT Kitchen & Lounge; Castelletti Restaurant; Tosca Restaurant; Madliena Lodge; La Vida; Rickshaw; Miro; Rubino; Country Terrace; Capistrano Restaurant; The Boathouse Restaurant; Lovage Bistro; Ristorante La Vela; Phoenix; Capo Crudo; L’Artiglio Ristorante; Le Bistro; 59 Republic; Tal-Familja; The Fork and Cork Restaurant; and Bacchus. Additional awards were presented for: Best Food (Root 81); Best Service (Dinner in the Sky Malta); Best Ambience (Dinner in the Sky Malta); Best Maltese Food (Gululu); Restaurant Most Dedicated to Supporting Local (Country Terrace); Best Chef Award (Marvin Gauci); Best Business Entertainment (Caviar & Bull); Most Romantic Restaurant (Palazzo Preca); Best Value for Money (iPlace); Best Restaurant offering Vegetarian options (Taro); Most Children-Friendly (iPlace); Best Newcomer (The Chef’s Table); Best Restroom (districtfive); and in memory of Colin Best – co-founder of the Restaurant Guide – The Colin Best Award for the Most Consistently Outstanding Restaurant in Malta & Gozo for 2017/2018 (The Medina). The Wine Glass Company Wine Awards, were as follows: The People’s Choice Wine List (taken from results of returned surveys (districtfive); The Riedel Wine Experience of the Year (Tarragon); Wine List of the Year (Ristorante La Vela); Commended Wine Lists (Cent’Anni, Country Terrace, one80 Kitchen & Lounge, Miro); and The Best Maltese Wine List (Ristorante La Vela). 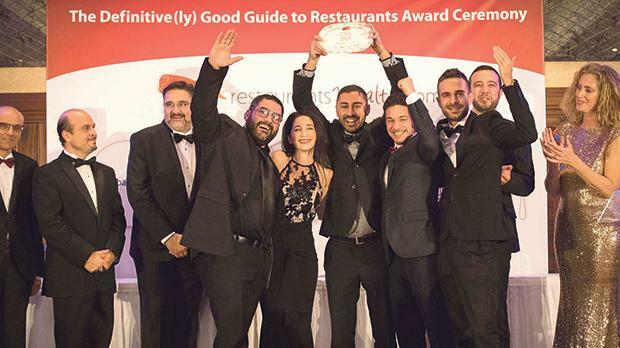 The results of the survey can be found in the 2019 edition of The Definitive(ly) Good Guide to Restaurants in Malta and Gozo. Buying the guide online for €8 also entitles buyers to a free hard copy in the post. The guide is available at leading stationers and bookshops.